I used JB-08780 Merry Little Christmas 1 5/8" & 2" for my very white card today. My layout inspiration started with Mojo Monday Sketch #159. I started off with a white cardstock base, added a white dry embossed (with a snowflake embossing folder) layer and topped that with some heat embossed snowflakes. I stamped the snowflake randomly and heat embossed with clear embossing powder. I added a silver pearl from Pizzazz Aplenty in the center of each snowflake. For my sentiment, I stamped "Merry Christmas to You" in Memento Tuxedo Black, cut out with a Spellbinders standard circle die and attached it to a Heidi Swapp acetate snowflake. All layers are popped up with foam tape. JustRite Stampers: JB-08780 Merry Little Christmas 1 5/8" & 2", JB-09500 Clear Stamper 1 5/8"
Accessories: Standard Circle Nestabilities-LG, die 2 (Spellbinders), Dotted Wave border punch (EK Success), Snowflakes embossing folder (Provo Craft), Clear embossing powder, Silver pearls (Pizzazz Aplenty), Acetate snowflake (Heidi Swapp), Silver ribbon, Foam tape, Thread, Sewing machine. ABSOLUTELY STRIKING! LOVE those gorgeous snowflakes and all that white! A true winter beauty!!! Very inspirational!!! This is so beautiful and elegant!!! Stunning card Stephanie! Love those embossed snowflakes! This is so different and soooo elegantly done. Beautiful. Very pretty! I love the embossing and all the whiteness! 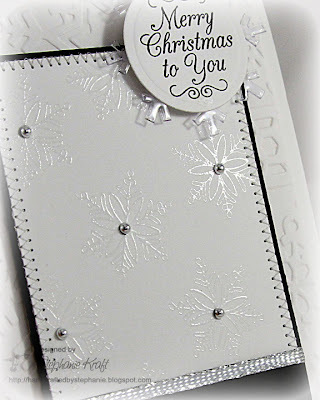 I really like that snowflake embossing folder you used, it doesn't look like my CB snowflake ef. Simply elegant!! True winter card. Simply Beautiful Stephanie - love all the white and black to accent!!!! Very pretty! I love heat embossing! Beautiful card. It's as lovely as fresh fallen snow. What a special card. Lovely. Beautiful. Like anything it is not, and has the atmosphere of Christmas. Congratulations. So elegant & lovely! Love it! What a beautiful card! Simple and elegant. Love it! Oh this is stunning! I love the contrast and the tone on tone heat embossing! Lovely!! Stunning! Love the elegance and beauty!